The Woods Green Bay Banquet Facility can accommodate any type of party or event from weddings and anniversaries to banquets and business seminars. Our banquet rooms all overlook the picturesque Woods Golf Course, are seasonally decorated and offer the areas largest bars to accommodate your guests with ease. The Woods Sports Pub and Grill The Woods also has a year round Sports Pub & Grill with a full menu and many activities to get involved with. We are also available for parties! The Woods Friday Night Fish fry is an excellent way for you to enjoy the quality of our food and service. ALL NEW! !.....The Woods has added numerous HDTV'S throughout the Pub & Grill area...come join the fun for all your favorite sporting events and the NFL Network. Now offering The Woods Famous Broasted Chicken to go 7 days a week! I went to a wedding reception there and most of the people including myself obtained Food Poisoning. I strongly recommend eating or drinking in a safer environment. The bar/restaurant area is large and clean. Plus they occasionally have good entertainment which makes it worth the trip. 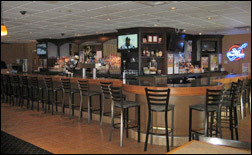 They also have good drink specials and it's a good and lively place to meet with friends. Can't say that I've tried the food myself, but I hear the broasted chicken is good. Good food and a nice atomosphere. Atmosphere! That's what I think of when I think of The Woods. Great sports bar, place to take my family for dinner, you can sit outside and enjoy the awesome scenery. Just kick back, relax and let the friendly staff wait on you! Great bar for a beer and burger. Get the sport chips. The course is very diverse from hole to hole. While some courses are more wide open The Woods has very challenging holes with big dog legs and a lot of trees. I look for 2 things in a gold course, challenging holes and nice greens, they offer both. As a bonus they have great drik specials... count on double bubble most nights of the week! The Woods is an awesome place to catch a bite....either after golfing, or for a business lunch, or for a formal affair in their great banquet rooms. The sandwiches and wraps are great, the chili is the spiciest in the city, and the burgers and fish are outstanding. We enjoyed the Thanksgiving all-you-can-eat dinner, and try to attend as many Packers tailgate parties there as we can, as there many large TV's are the perfect place to watch any sporting event ! Carryout, Broasted Chicken to go 7 days a week! 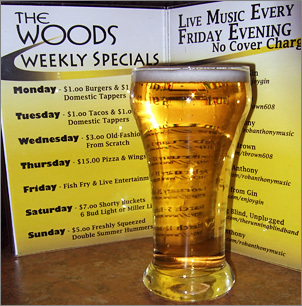 The Woods Sports Pub & Grill is located on the far East side of Green Bay. It is a very casual and very clean restaurant. Also, there is a nice view of their golf course. The pub is pretty open with a large bar accompanied with plenty of tables for dining. There are many TVs situated throughout the restaurant which were all tuned into various sport channels. There a few arcade game machines and a pool table set off to the corner. My server was warm and friendly and asked me if I would like anything to drink. They then gave me the menu and told me of the soups of the day. I decided to order a bowl of The Boss’s Chili for $5.99. They also carry the Woods Chili. 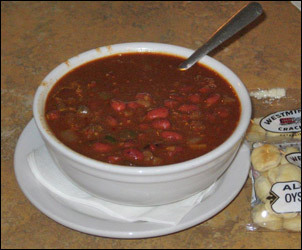 The Boss’s Chili is made specially and brought in by a retired bar and restaurant owner while the Woods Chili is made in house. My chili was served to me in a large white ceramic bowl with 4 packets of oyster crackers. If you like kidney beans and a lot of jalapeno peppers you will love this chili. The flavor of Boss’s chili is salty and hot. This chili is loaded with kidney beans and ground hamburger. The Woods also carries on their menu grilled sandwiches, wraps and salads, soups and hamburgers. Before this week turned out to be such a buzz kill on my springtime mood, I got a quick peek at a place that I think will be crazy busy in the summer. I'll give you a hint... "Fore!" And because I know you really REALLY want to know what that word means, here's the definition, "Foré!" is shouted as a warning during a golf game when it appears possible that a golf ball may hit other players or spectators. The mention of the term in an 1881 British Golf Museum indicates that the term was in use at least as early as that period. The term means 'look ahead,' and it is believed to come from the military 'beware before,' which was shouted when a battery fired behind friendly troops." Now, is that true? I have no idea, but Wikipedia says it is. A couple of friends and I were looking for a place with big windows or a patio to sit and enjoy the day. The Woods got thrown in the mix because they have both. And so the golf club easily won. The Woods is located on Green Bay's east side kinda out in the country part. It may not seem country-ish to you but from what I'm used to, I sure thought it was. But it's still a short trip nonetheless. After we piled out of the car and walked inside I immediately saw a shuffle board table. I love those things. Lots. We then walked past my beloved game and towards the bar. The bar is on the right with a few hightops adjacent to it. The Woods also has regular sized tables throughout the dining room, plus there is a large banquet hall for private functions closed off in another room. On tap they serve Miller Lite, Blue Moon, Coors Light, Honey Weiss, Bud, Bud Light, Smithwicks, Harp, Guinness, and Hinterland Amber. With it being a Monday, their domestic tappers were a buck. Nice. I also saw a sign that said the Sunday special was a double summer hummer drink for $5. I'll have to come back for that. They also have a fully stocked liquor bar and a few wine choices too; plenty of choices for you to get your drink on. I had no idea what to expect for a golfing sports pub but The Woods' keeps it nice and simple; a few flatscreen TV's and some beer posters. The real lure is the patio and big windows. When a place has awesome scenery and a cool patio to sit back and relax on, does it really need all the frills that other sports bars have? I think not my Packer people. This really would be a great place to go for a little fun in the sun and a refreshing cocktail or nice dinner afterward. I'm not one for golfing but I can putt putt like no other so how hard can it be to golf, really. Plus, if I'm terrible, err, when I'm terrible I can always go to their patio. For me, that truly is a win-win situation.